Following the critically acclaimed success of Agatha Christie’s The Secret Adversary read by award-winning narrator Alison Larkin comes the very first Hercule Poirot mystery. 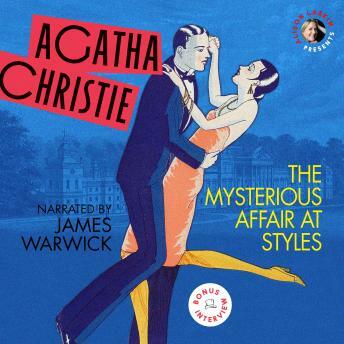 Brilliantly read by James Warwick, star of the PBS Tommy and Tuppence Partners in Crime TV series, this delightful, authentic recording of Agatha Christie's first novel is followed by an exclusive interview with James Warwick and Alison Larkin. When Emily Inglethorpe dies suspiciously after marrying a man 20 years her junior, her nephew, Captain Hastings, recruits his old friend Hercule Poirot to help in the investigation. Other popular audiobooks from Alison Larkin Presents include the AudioFile Magazine Earphones Award-winning recording of Peter Pan and The Inconsiderate Waiter by J. M. Barrie, The Secret Adversary by Agatha Christie, the 200th anniversary audio editions of Pride and Prejudice, Emma, and Persuasion and Poems by Jane Austen, and Alice in Wonderland and Jabberwocky with a short excerpt from the Life and Letters of Lewis Carroll and Through the Looking Glass and Phantasmagoria by Lewis Carroll. The book was ok the narrator was terrible. The volume was atrocious one minute you can barley hear and the next was so loud.